Posted on April 21, 2019 by The Roundup and filed under Houston, Southwest Round-Up and tagged Houston Cougars Dana Dimel Kim Helton Alvin Brooks Dana Holgorsen Clyde Drexler Andre Ware David Klingler Chuck Weatherspoon Jack Pardee John Jenkins Robertson Stadium TDECU Stadium Fertitta Center Renu Khator Tillman Fertitta Matt Campbell West Virginia Hofheinz Pavillion. Posted on December 30, 2018 by The Roundup and filed under Houston, Southwest Round-Up and tagged Houston Cougars Renu Khator Major Applewhite Chris Pezman Tillman Fertitta Mark D'Onofrio Todd Orlando Kliff Kingsbury Dana Holgorsen. Posted on December 26, 2018 by The Roundup and filed under Houston, Southwest Round-Up and tagged Bill Yeoman Red Blaik Houston Cougars Duffy Daugherty Guy Lewis Elvin Hayes Don Chaney Darrell Royal Frank Broyles Warren McVea D.C. Nobles Danny Davis Delrick Brown Lionel Wilson Gerald Landry Bear Bryant. Posted on December 19, 2018 by The Roundup and filed under Baylor, Houston, North Texas, Rice, SMU, Southwest Round-Up, TCU, Texas, Texas A&M, Texas State, Texas Tech, UTEP, UTSA. Posted on December 14, 2018 by The Roundup and filed under Houston, Southwest Round-Up and tagged Houston Cougars Terry Elston Kelly McDonald George Welsh Bill Yeoman Navy Terald Clark On This Date. Posted on December 7, 2018 by The Roundup and filed under Houston, North Texas, SMU, Southwest Round-Up, TCU, Texas, Texas Tech, UTEP, UTSA and tagged Kris Boyd A.J. Hotchkins C.J. Levine Josiah Tauaefa E.J. Ejiya Austin Robinson Khairi Muhammad Adrian Frye Ben Banogu Ed Oliver Charles Omenihu Jeff Gladney. Who’s up for some superfluous and seemingly meaningful awards? Us neither, but here we go. We present the All-SWC Offensive Team for 2018. We could’ve gone either way on this one with King or North Texas’ Mason Fine. Ultimately we went with King for a couple of reasons. First, he finished second in the NCAA in TDs accounted for (50) behind Kyler Murray and Dwayne Haskins (51) in spite of playing in two fewer games. He finished with the eighth most yards per game, the seventh best QB rating, fifth most TD passes, and sixth most yards per play in the FBS. The only SWC back to rush for over 1,000 yards (where hath all the great rushers gone?) took his stellar career to another level with 1,524 yards rushing and fifteen scores for the Aggies this season. He carried the Aggie offense down the stretch. Proche put together a stellar season, catching the fourth most passes in the FBS with 93 with twelve touchdowns. Proche was at his best against SMU best competition, averaging eleven catches per game against ranked opponents and eight catches per game against teams with a winning record. Wesley made electric catches every week, highlight reel stuff. He finished the season with 88 catches and averaged 117.5 receiving yards per game. Wesley added eight touchdown catches as well. When Sam Ehlinger needed a big play, a conversion, or just a security blanket he found Lil’Jordan Humphrey. The junior from Southlake Carroll caught 79 passes for nine touchdowns. Most impressive was his seventeen yard average on third down catches. Meet the revelation among the destruction that is Keenen Brown. The Oklahoma State transfer caught 51 passes for the Bobcats with five scores. He also added 9.8 yards per carry and scored twice rushing the football. The Atascosita redshirt freshman hit the ground running, starting by the second game of the season and earning Honorable Mention All-Big 12 accolades. 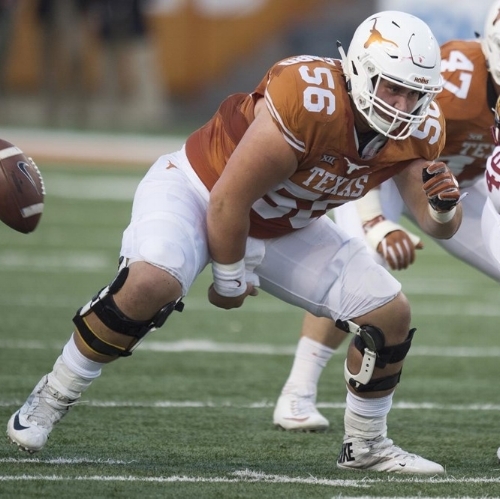 Cosmi is a long, rangy lineman who moves well and has the frame to become the next big time Longhorn lineman. The sophomore guard has started every game since showing up on campus two springs ago. This season Anderson made second-team All-Big 12 and turned his game up another notch for Tech’s high powered offense. The Euless Trinity and Tyler JC product continued to act as a pillar in the middle of North Texas’ offensive line. Lining up next to his brother Manase, the Mose’s give the Mean Green a physical punch inside. The third-year starter for the Horns started his 26th game as a Horn and in spite of missing several starts due to injury makes the list. Shackelford showed up as a mauler, and his reputation continues to grow. Texas offense is much better with him in the middle. TCU went way up to New Canaan, Connecticut to find Niang who made his 20th career start for the Horned Frogs and helped ease the transition of a rebuilding offensive line by anchoring the right side. Posted on December 6, 2018 by The Roundup and filed under Southwest Round-Up, Houston, North Texas, SMU, TCU, Texas, Texas A&M, Texas State, Texas Tech and tagged D'Eriq King Mason Fine Trayveon Williams James Proche Antoine Wesley Lil'Jordan Humphrey Keenen Brown Sam Cosmi Jack Anderson Sosaia Mose Zach Shackelford Lucas Niang Sam Ehlinger. Pay that man his money. Posted on November 28, 2018 by The Roundup and filed under Houston, Southwest Round-Up and tagged Houston Cougars Kendal Briles Major Applewhite Chris Pezman Texas State Bobcats Mark D'Onofrio. Posted on November 28, 2018 by The Roundup and filed under Houston, Southwest Round-Up, Rice and tagged On This Date David Dacus Kimble Anders Jason Phillips Jack Pardee Mark Comalander Billy Joe Tolliver Houston Cougars Rice Owls Bill Yeoman John Jenkins. The coaching carousel is spinning. Posted on November 26, 2018 by The Roundup and filed under Southwest Round-Up, North Texas, Houston, Texas State, Texas and tagged Mack Brown Gene Chizik Kliff Kingsbury Larry Teis Art Briles Kendal Briles Seth Littrell Jeff Brohm Bill Snyder Chad Morris Mark D'Onofrio Todd Orlando Major Applewhite Ed Oliver. Posted on November 21, 2018 by The Roundup and filed under Baylor, Southwest Round-Up, TCU, Houston and tagged Dirty Work E.J. Ejiya North Texas Houston Cougars Patrick Carr Ben Banogu TCU. It’s all jackets these days. Posted on November 16, 2018 by The Roundup and filed under Houston, Southwest Round-Up and tagged Ed Oliver Major Applewhite Jimmy Johnson Emmitt Smith Troy Aikman Michael Irvin Baker Mayfield. Posted on November 14, 2018 by The Roundup and filed under Houston, Southwest Round-Up and tagged Justin McMillan Tulane Willie Fritz Major Applewhite Houston Cougars LSU. Posted on November 13, 2018 by The Roundup and filed under Houston, Southwest Round-Up and tagged Houston Cougars Gear Head. A top ten matchup for the crown. Posted on November 11, 2018 by The Roundup and filed under Houston, Southwest Round-Up, Texas and tagged On This Date Houston Cougars Texas Longhorns Danny Davis Fred Akers Russell Erxleben Kenny Hatfield Emmett King Randy Love Garrett Jurgajtis Willie Adams. Posted on November 11, 2018 by The Roundup and filed under Southwest Round-Up, North Texas, Rice, SMU, TCU, Baylor, Houston, Texas, Texas A&M, Texas State, UTEP, UTSA, Texas Tech and tagged Sam Ehlinger Lil'Jordan Humphrey Kliff Kingsbury Trayveon Williams Seth Littrell David Montgomery Greg Roberts Charlie Brewer Shawn Stankavage Ryquell Armstead Will Grier Willie Jones Otaro Alaka James Proche Xavier Jones Ke'Mon Freeman Elijah McQueen Nikolas Daniels Darryl Godfrey Austin Walter Jalen Reagor Garret Wallow A.J. Hotchkins D'Eriq King. No then end of the world. Posted on November 9, 2018 by The Roundup and filed under Houston, Southwest Round-Up and tagged D'Eriq King Houston Cougars Temple Owls Anthony Russo Kendal Briles Geoff Collins. 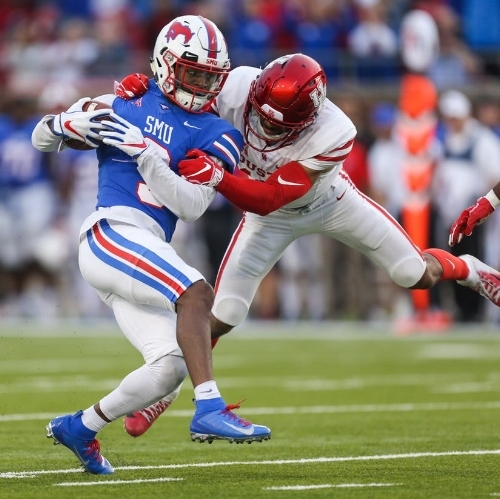 Posted on November 7, 2018 by The Roundup and filed under SMU, Southwest Round-Up, Houston, UTEP, Texas, Rice and tagged Dirty Work SMU Texas Longhorns Houston Cougars UTEP Rice Owls Ke'Mon Freeman Sam Cosmi Andrew Beck Quardraiz Wadley Hayden Howerton Alan Ali Bobby Deharo Trent Thompson Jerrod Brooks David Lucero. Posted on November 5, 2018 by The Roundup and filed under Houston, SMU, Southwest Round-Up and tagged Art Briles Phillip Montgomery Kevin Kane SMU Houston Cougars Pono Davis Ken McLaurin Richard Moore Kyran Mitchell Patrick Nelson Elijah McQueen Mikial Onu Rodney Clemons Vance Bedford Bryce Petty Marquez Stevenson D'Eriq King. On this date in 1992, somebody needed a little defense. TCU and Houston often lacked defense when they met in the late 80s and early 90s. 1992 was no different, on Halloween, both teams dressed up like high flying offenses. Houston beat TCU 49 to 46 in spite of nine turnovers and a feisty Horned Frog attack. Former Heisman winner Pat Sullivan’s team jumped out 21-7 and held a 21-14 lead at the half. Houston quarterback Jimmy Klingler rotated with Donald Douglas most of the season, but an injury gave Klingler the start. He rewarded head coach John Jenkins with four picks. In the second half Klingler and running back Lamar Smith took over. Smith ran 29-yards for his second touchdown of the day, and Klingler hit Ron Peters to give the Cougars their first lead, 28-21. TCU fired right back with a Leon Clay touchdown pass and a Curtis Modkins 55-yard touchdown run. With a few seconds to go in the third, Klingler found Sherman Smith for a tying score. On the afternoon Klingler completed 42 of 65 passes for 392 yards. The Coogs dropped nine passes and Klingler threw five picks but the total was the most passing yards of any quarterback in college football that week. Houston went ahead for good with Jamie Mouton returned a punt 76-yards for a score. TCU added a field goal before Smith caught his second touchdown pass of the day with five minutes to play, giving Houston a 49-38 lead. TCU didn’t cash-out, they added a Lenoy Jones fumble recovery for a touchdown to bring the Frogs within three and the final tally 49-46. TCU won two games in Sullivan’s first season in charge. Houston ended the 1992 season 4-7, they gave John Jenkins his walking papers. On This Date: Southwest Texas Beat Lackland. Yes Lackland. Posted on October 31, 2018 by The Roundup and filed under Southwest Round-Up, TCU, Houston and tagged Jimmy Klingler Curtis Modkins Leon Clay TCU Houston Cougars Lenoy Jones John Jenkins Pat Sullivan Ron Peters Lamar Smith Donald Douglas Jamie Mouton Sherman Smith On This Date.